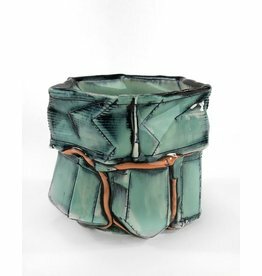 Brett Freund received his MFA from Southern Illinois University in 2011 after completing a residency at St. Petersburg Clay Company. Following his education, he was a Lormina Salter Fellow at Baltimore Clayworks and in 2012 was named an Emerging Artist by Ceramics Monthly. He has since relocated to Minneapolis, where he maintains a studio and is a teaching artist at Northern Clay Center, and has received a 2015 Jerome Ceramic Artist Project Grant and a 2018 McKnight Artist Fellowship Award. Freund’s work starts with prototypes designed from hand building, wheel throwing, and 3D printed clay. He uses these components to make new combinations and discoveries as he intuitively pieces together slip cast parts. Though attracted to techniques associated with the industrial process and mass repetition, each piece he makes is arranged so that no piece is ever exactly the same as another, putting a filter between the material and himself. Read more about Freund's life and work here. Learn about Freund's McKnight Artist Fellowship project here.